my Ink well: Happy Spooky Halloween! I had fun looking through my Halloween stash today and coming up with this card. My color inspiration was Dynamic Duos #20 and CASual Fridays CFC70, and my design was taken from Retro Sketch #29. Thank you for coming by. Have a great day! Oh Stephanie, he is just charming. And three of him is even better!! So glad to see you at Dynamic Duos! This card is super duper cute!!! Oh, fun fun fun. I love all the details - your web border, the skeletons, and that creepy spider. Thanks for playing along at Dynamic Duo's this week! Very very cool card, love those images. Such a fun card. Getting me in the mood for Halloween already. How cute and fun!! Love those skeletons and that green with black and white is one of my all time faves! Awesome job! Thanks for playing along with us this week at CAS-ual Fridays! The cutest halloween card I´ve ever seen! Frighteningly fun! Thanks for playing along with us at Dynamic Duos! 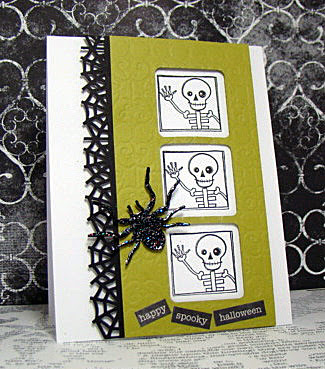 Love your skeleton image and your sparkly spider, fun card. Thanks for joining us at Dynamic Duos. Cute skeletons! Love the spider web border! It's just too CUTE...love it! 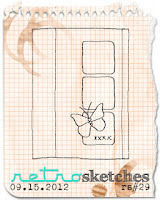 Stephanie I love what you did with this sketch! SO fun! Great details too! Thanks for playing along at Retro Sketches and CAS-ual Fridays! Lovely card. Creative design. I have chance to work for a company as Plastic id cards online designing, and i would like to try like this, if you don't mind. I appreciate this.